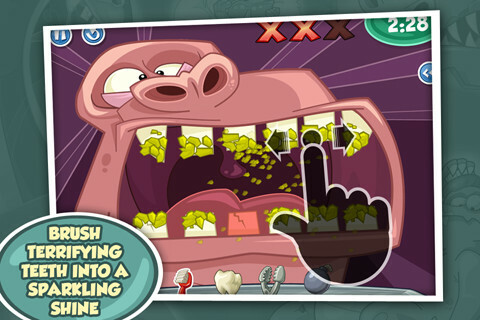 Monster Mouth is an iPhone, iPad, and iPod touch game by Breaktime studios. The object of Monster Mouth is to spread the joy of proper oral hygiene to giant monsters, one mouth at a time. Despite their leviathan-like size these monsters are in a considerable amount of pain and it is your job to bring them relief. It should come as no surprise that your main weapon in the battle for clean teeth is the toothbrush. In every level you are required to brush off the buildup of gunk that has deposited itself on the monsters’ teeth by vigorously sliding your finger back and forth before moving on to more serious repairs. Despite the decent range of tools to mix things up in your arsenal the toothbrush is still your go-to, which can get quite labor some and monotonous as you start to wonder whether you’re going to burn a hole through the screen of your device. Once you’ve properly brushed the teeth you can conduct an x-ray, pull the tooth, destroy cavities, and perform a number of other procedures to return the monsters’ mouths to a prime condition. Finesse is definitely required: choose the wrong move and you could cause the monster pain. After three strikes of this the monster has enough and presumably fires you until you’re ready to try again. As you progress through your operations various obstacles arise, and you must often deal with them accordingly before continuing with the rest of your procedure. There is definitely a sense of urgency as you race against a timer, and if you’re not fast enough more gunk will build up onto the teeth, which will unfortunately require another hearty round of brushing. Monster Mouth is generally accessible and easy to jump into. Once you pay for the full game all the levels are unlocked and there is no specific order you have to play in. It may have been that I was playing out of order, or I may have missed something, but a few of the new tools/weapons seemed to lack tutorials. Despite this the controls were simple enough to where you could figure out what to do with the new weapon with little to no inconvenience. There was little progression of difficulty; some levels were just harder than others. The final level was a bit of a marathon but was certainly not the most difficult. Monster Mouth DDS is free to try and $0.99 to buy via in-app purchase. AppSafari review of Monster Mouth DDS was written by Neema Akhtar on September 8th, 2011 and categorized under Action, App Store, Arcade, Games. Page viewed 4397 times, 2 so far today. Need help on using these apps? Please read the Help Page.